My bunk room morphed up to warmer last night. The crew told me the building was so well insulated that a person’s body heat was often sufficient to turn things around. The bunk houses are heated to around 60 degrees in the off season as well, as there is a caretaker for each hut. However since it is not a full season with a dedicated hut staff to stoke the fires in the basement on a regular around the clock schedule, there might be small fluctuations in heat (never below 50, between 57 to 65), depending on the outside temperatures. Hot water prevails, as well. In the morning, I made myself drip coffee from the pile of filters and fresh ground Carabasset the boys set out for me before they went up last night. Normally, breakfast is served st 7:40, but I suggested that they sleep in, courtesy of me! At 8 sharp I was sitting in the dining room in front of a hot plate of eggs, sausage, and toast. Lunch fixin’s were set out for me to make my own peanut and jelly sandwich, accompanied by a brownie and granola bar. The morning light illuminated the shore and the few leaves that remained on the deciduous trees. I’m heading back today. On the way in here, it was unsafe to listen to music via earphones and iPhone- too many pulp trucks thundering down Long Falls Dam as well as the gravel Carriage Roads to be distracted by tunes. I needed to hear these trucks coming. They don’t slow down at all and the roads are narrow. This is the last weekend for MH&T to offer their full service meal plans as part of the package here (at regular rates). Twenty folks are coming in today to stay for this last serviced weekend- a ” yoga group”. From October 29 until December 19 daily rates drop more than 50%, down to $35 for nonmembers and $30 for members. For that price, you get everything this place offers except the meal plan. Guests are free to bring in their own food and use the kitchen. In sum, I enjoyed my stay here. The facilities are unique- interesting and comfortable. I liked being taken care of. The shower was hot, the couch and reading chairs were super comfortable. 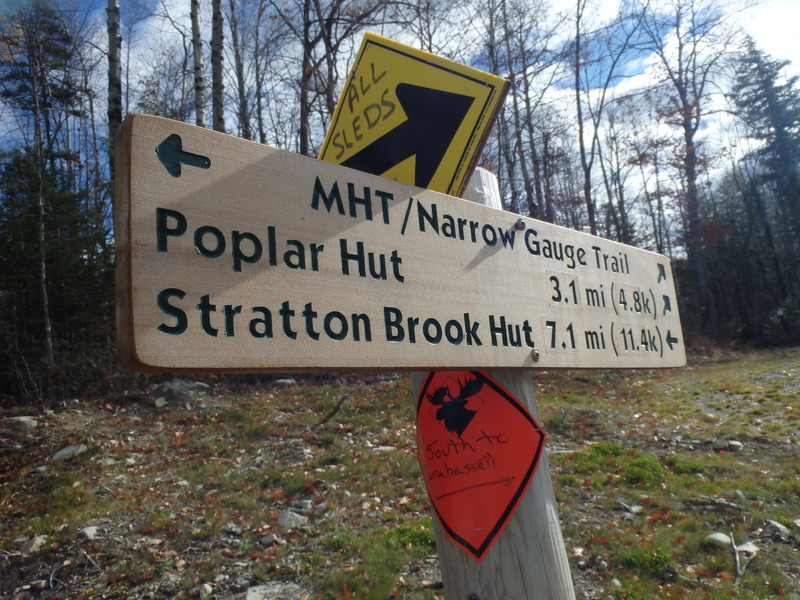 One of the parts I liked about the trip into here along the trail from Sugarloaf/Route 27 was crossing the Appalachian Trail at the exact same place that I walked over on my 2007 thru-hike. Two thousand miles on AT from Georgia to here! It brought back positive memories. 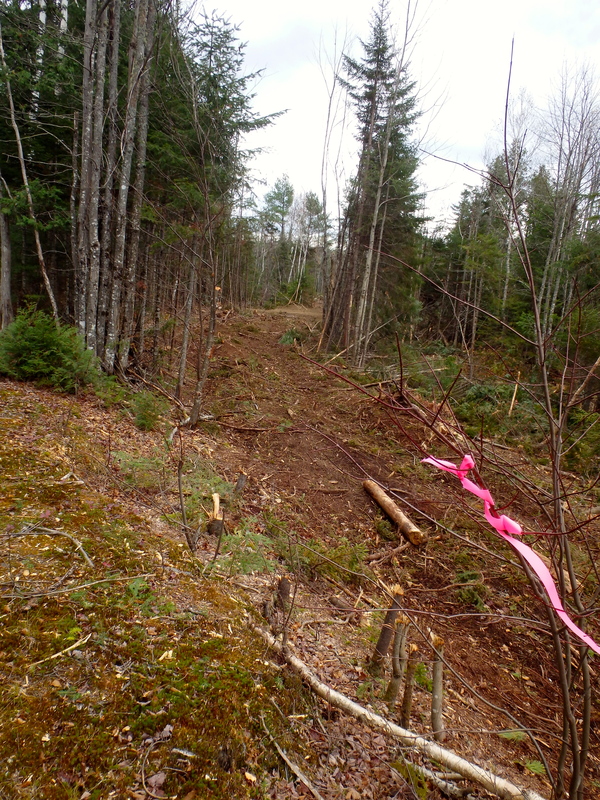 People need to know that the terrain that surrounds the MH&T trail is mostly low country, and right now is surrounded by fresh logging activity. It’s often not so scenic. Don’t get me wrong- in the warm weather the deciduous leaves will hide the freshly cut slash and stumps. Conversely, when the area is blanketed by snow the skiing, snowshoeing, and even mountain biking will be framed in a more natural situation. I could be wrong, but there is one more reason why MH&T lets their crews go for the next month and a half. It’s deer hunting season in Maine, and folks will definitely need to be wearing hunter orange if they travel these woods in November. This looks like prime hunting territory. This is quite an undertaking- these ” wilderness hotels” that are steadily coming online up here. I am really pleased to finally experience what they are all about. I appreciated the care and attention that the staff gave me here, even though I was the only client. I plan to be back here before the rates double up and return to normal just before the Holiday season. I have viewed enough YouTube clips to know that I want to ride my Pugsley along the groomed snow pack. Yesterday, I changed my plan to backpack up here when the weather report scared me. Last week’s unseasonably warm Indian Summer is history. It’s 1:30 in the afternoon and I’m here at the Maine Huts and Trails Flagstaff hut complex. 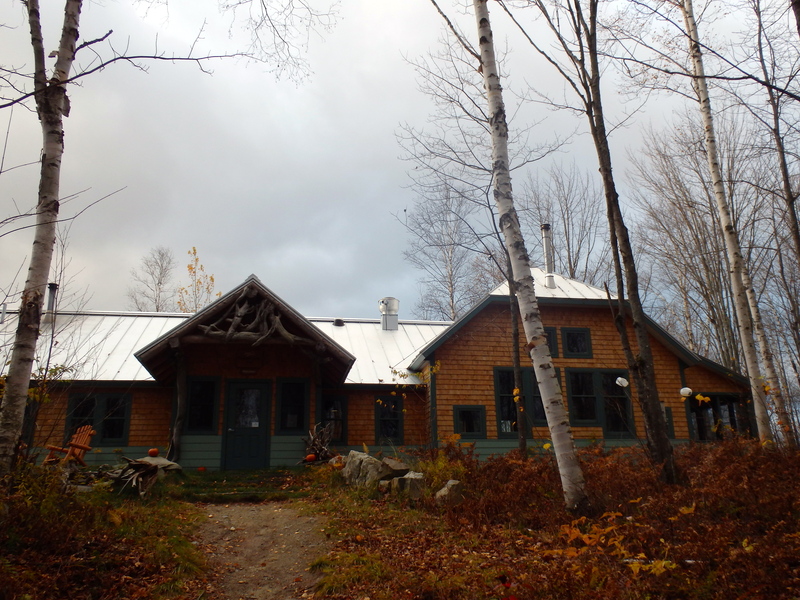 This is my first time with Maine Huts and Trails, where they staff sustainable outdoor hotels in the forest. It’s 31 degrees out, with strong wind off Flagstaff Lake that’s pushing the cold even deeper today. 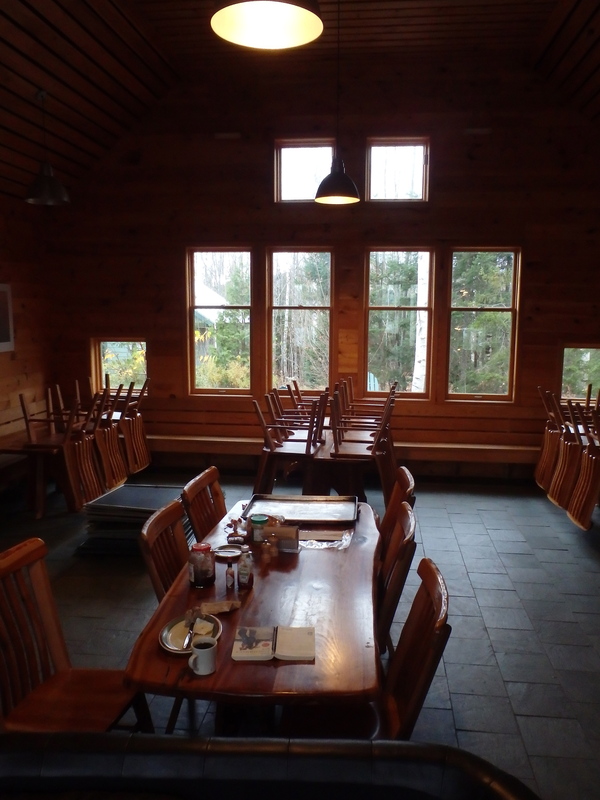 Snow flurries are scurrying about outside the insulated walls and windows of this main lodge- recently constructed on eastern shore of Flagstaff, a man-made lake that is the fourth largest in Maine. 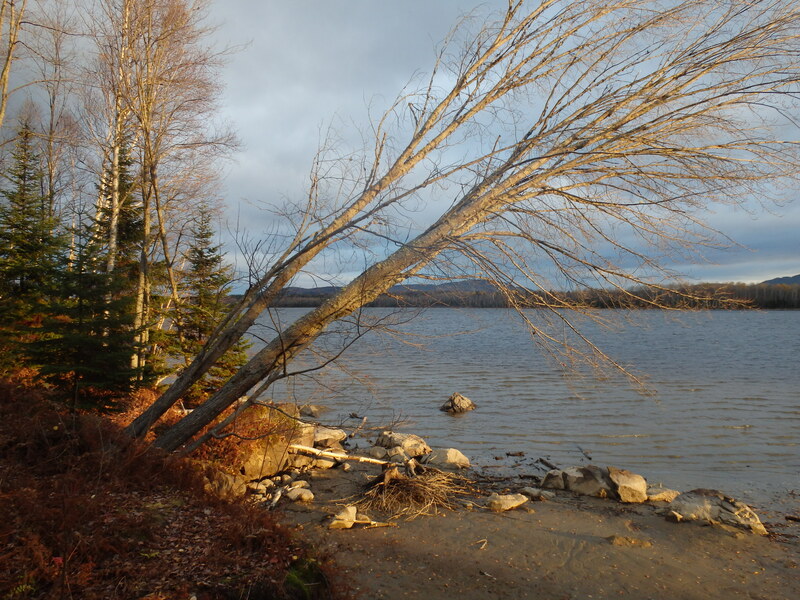 I have camped in this area in all seasons, including one winter trip inside a heated wall tent about a mile from here when the temps dropped to 20 below, with an even colder wind off the lake that refrigerated the air around the tent’s wood stove. No amount of stoking could raise the heat in the tent to a comfortable level. My original plan was to hike on the Appalachian Trail for a few days, in an area where I enjoy hanging out. I stayed at the local “hiker oasis”- the Stratton Motel last night, so that I could get an early start. My plan was to walk southbound on the AT from Route 27, then up and over the side trail to Sugarloaf summit. I like going up and over Sugarloaf- it’s the original Appalachian Trail route after all. I hoped I could get out of the elements and bed down in the now decrepit and supposedly vermin-infested Summit building. Today would have been a 12 mile day if it all worked out. But several factors combined to change my mind. Cold– how about nights in the 20’s? Uncertainty– about whether staying in the Sugarloaf summit building was still possible. It has been gloom and doom about the place for at least the past 5 years. In the warmer weather many options exist for sleeping, but right now I don’t want to either stand around in the long hours of dark and freezing cold. I envisioned getting way up there and finding the doors nailed and locked shut. Spending tonight up high in a little flimsy tent is definitely not on my Bucket List. I have not so fond memories of a yet another very cold, miserable December night- up on Bigelow- that does not need repeating. Two other factors pushed the hiking into the “Nope” zone. Both were unsettling. Both involved a connection to Sue Critchlow , the proprietor of the Stratton Motel/ Maine Roadhouse. The first was a 2012 article from the Boston Phoenix where Sue was one of the local Stratton/ Rangely residents who was quoted heavily concerning the history of weird hovering lights in the area. Shades of extraterrestrial visitation. The second was the 2013 mysterious disappearance of 66 year old Appalachian Trail hiker Geraldine Largay, who left the Poplar Ridge Lean-to shelter near Rangeley on Monday, July 22, after checking in with her husband via text message as she headed toward the Spaulding Mountain Lean-to, eight miles north. “Inchworm” (her AT trail name) had already hiked from Harpers Ferry, West Virginia, almost 1000 miles, with her final destination the AT terminus at Katahdin. She was last seen by three male hikers that afternoon near Lone Mountain, about three miles from the Spaulding shelter. To them, Largay, seemed fine. Then she vanished, launching one of Maine’s largest missing-person searches in memory. For 11 days, hundreds of people on foot as well as ATVs and horseback, along with a helicopter, airplanes, and nine search dogs failed to turn up any perceptible trace of her passage. Read more about the puzzle, including the mystery phone call Creighton stated she received from a woman who told her that she wanted to get word to George Largay that his wife would be late in meeting him. Full story here. 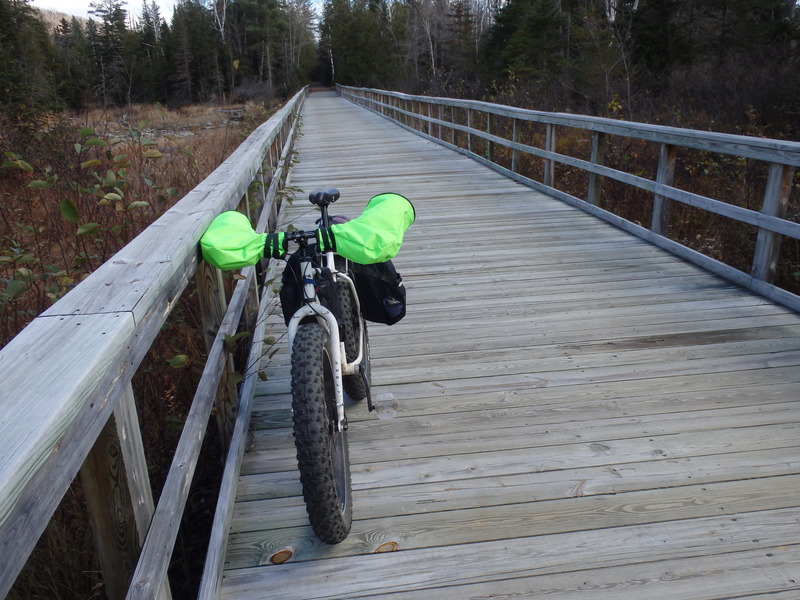 So, instead on a night out in the cold, mulling about the strange events here in drama city, I biked 19.2 miles from Route 27 today, where I put in at the trailhead parking for Maine Huts and Trails. I had the official map for this route, but needed to study it frequently, as it was my first time out on the route. 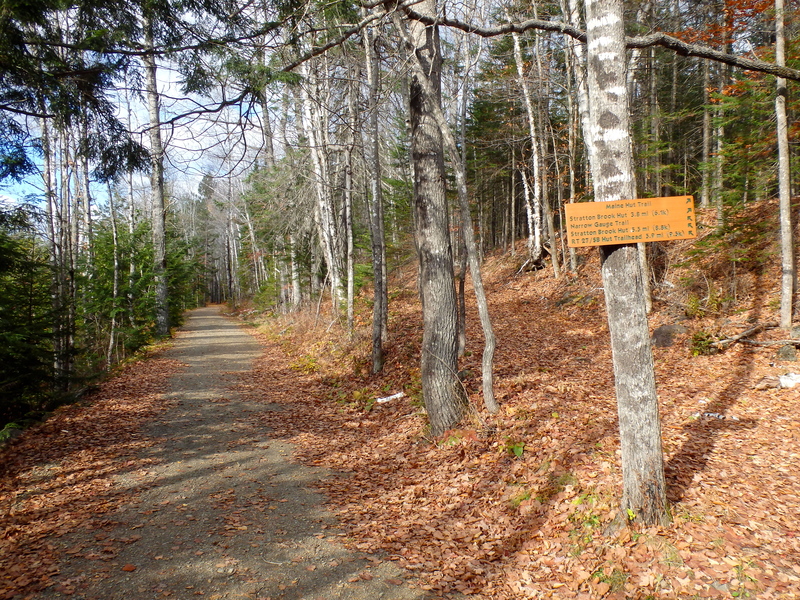 There were plenty of signage, but this same complex of trails is used by snowmobiles, all terrain vehicles, hikers, cross country skiers, and snowshoers. There was at least one intersection where there were four choices to decide upon. Sort of complicated. Sizing up the day at 7:10 PM tonight- it turned out great. I am the only guest here tonight, sleeping out in a three person dorm room in another cottage that is heated, but definitely not over 60 degrees. I spent the bulk of the afternoon on a big leather couch, about six feet out from a wood stove perched on a field stone hearth, where the warming flames of cowboy TV were visible through the glass doors. Two of the staff and I ate supper together- a stir fry over rice with homemade bread, brownies, and peanut butter cookie, capped off with a glass of cold milk. They even materialized a bottle of Allagash White for me ( $5). 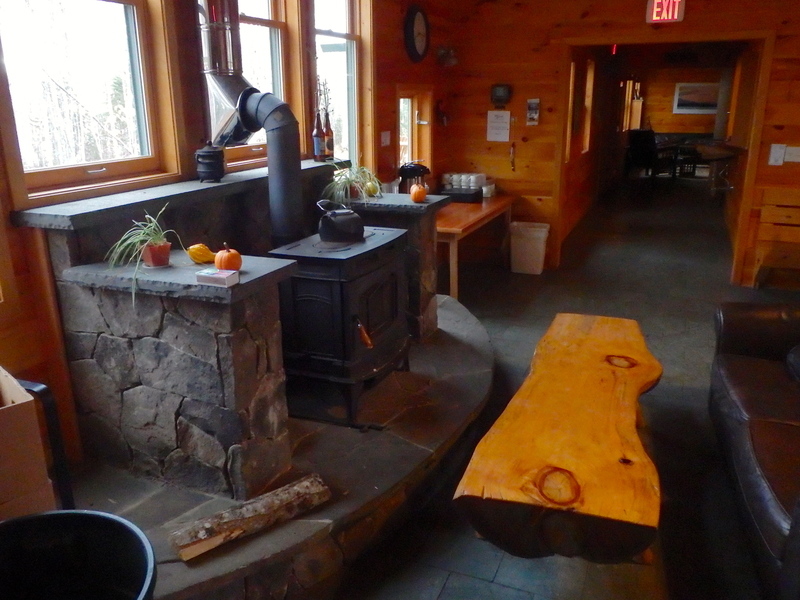 From 10/28/2013 to 12/19/2013, MH&T stops cooking meals for guests, but the Huts remain open, with a caretaker on premises. For that time period $35 a night ( $30 for members) gets you all the amenities ( yes for hot shower), including the use of the kitchen – $70 for a cold weather weekend of exploring in this area is a screaming deal. You could get up and over on the AT for a day hike up the Bigelows, walk the shore of this Lake a bit, or bring bikes up and ride around in the woods. Then hit the hot showers, use the kitchen, enjoy safe drinking water out of faucets, have electric lights to read by, and sleep in a heated room on a mattress. Long Falls Dam Road is plowed all winter. It’s important to understand that you cannot actually drive into any of the four available Huts. You have to hike, bike, ski, or snowshoe in. The 1.8 mile traverse into Flagstaff Hut from the TraiIhead parking lot is the shortest trip in to any of the huts. It’s a whoop on a bike. 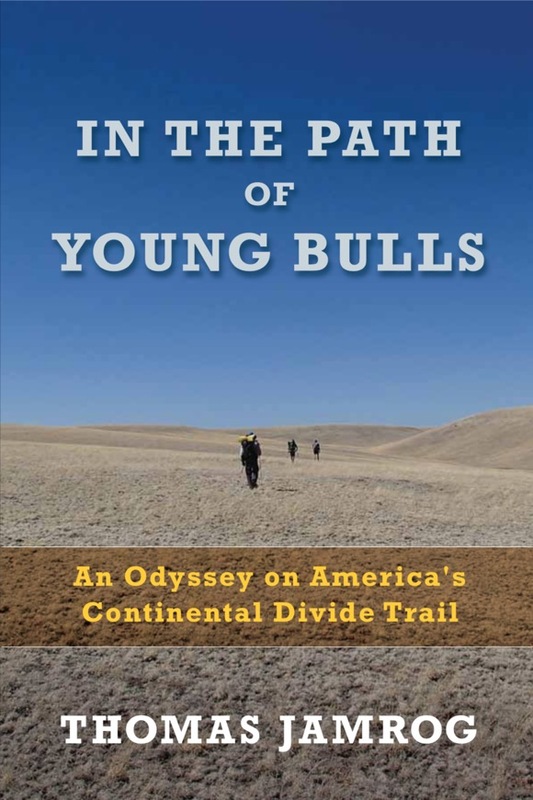 Here’s the link to my updated Trailjournal. Today’s entry is my “1 month post hike” report. 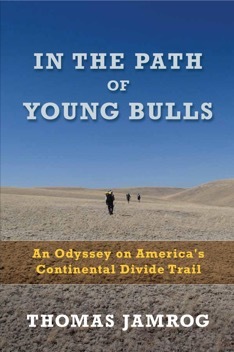 Uncle Tom's 2013 Continental Divide Trail Journal, Part of Trail Journals' Backpacking and Hiking Journals. Lengthen your life by four years with 30 minutes of exercise daily. Appears to be true ! Ask Well: Double the Workout, Double the Benefits? – NYTimes.com. Why is my Vitamin D level abysmal ? In preparing for a physical, I took a blood test this past week. I was also curious about my levels after spending 5 months backpacking. I received a call from my doctor that indicated positive results in all bio markers with the exception of Vitamin D. The blood test for D was the 25(OH)D blood test. The Vitamin D Council suggests that a level of 50 ng/ml is the ideal level to aim for. Mine is 23 ! The doctor’s office recommended that I immediately supplement 2,000 IU/ day. Cursory internet research suggests I need more. 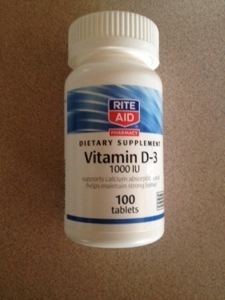 The Vitamin D Council recommends 5,000 IU/day of vitamin D supplementation in order to reach and stay at this level. The two main ways to get vitamin D are by exposing your bare skin to sunlight and by taking vitamin D supplements. Apparently you can’t get the right amount of vitamin D your body needs from food. I should have been able to metabolize adequate D from my daily exposure to intense sunlight for 5 months (ultraviolet B rays). This should have happened very quickly, particularly in the summer. The Vitamin D council suggests that you don’t need to tan or burn your skin to get vitamin D. You only need to expose your skin for around half the time it takes for your skin to turn pink and begin to burn. I hiked through the summer when the light was lengthy, and it was my habit to hike in short sleeve shirt and shorts. It appears that I will need to get vitamin D by taking supplements. Vitamin D3 is the best kind of supplement to take. It comes in a number of different forms, such as tablets and capsules, but it doesn’t matter what form you take, or what time of the day you take it. This same problem surfaced after my 2010 Pacific Crest Trail hike, another 5 months stint where I bathed in sunlight 95 % of those 150 days. My doctor even had me take 50,000 unit doses once a week for a month. Only a meager increase was gained, I didn’t ever reach 30. 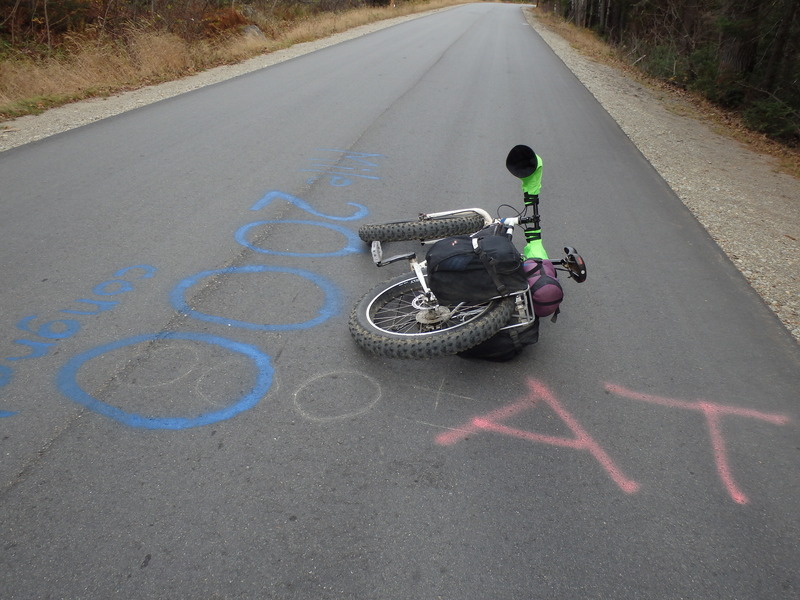 I do have some of the symptoms of Vitamin D deficiency ( tiredness and general aches and pains), but those are also consistent with the extreme demands of averaging 20 miles a day over 5 months. People who are deficient also have infections. I experienced a infected tooth on the Trail. Cause for concern? Anyone out there with some wisdom in this area to impart ?